Fairy tales have had resurgence in popularity in the past few years. On television we have Once Upon a Time and Grimm, which have captured the fairy tale world and blended it with our own. Just last year Disney’s animated feature Frozen became a worldwide box office hit. It’s not hard to see why those tales have stood the test of time to be told over and over again. They are often simple stories in which an ordinary person must overcome their fears to defeat a force of evil. These stories also throw in a lot of relatable elements like familial relations, jealously, feeling like there should be more to life, and of course love. Maleficent, the new live-action take on the classic story of Sleeping Beauty contains all of those elements, but unfortunately fails to do anything interesting with them. Though Angelina Jolie gives an energetic performance in the title role, she can’t save this film from its mediocre storyline. I’m assuming most know the basic story of Sleeping Beauty, so I won’t waste time going over the plot (and since I warned of spoilers, I’m hoping you already have seen this film). I will explain what ultimately stifles what could have been a charming story. 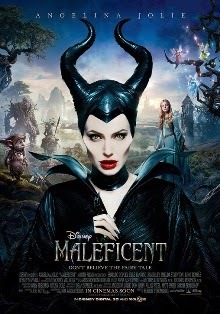 As I said earlier, Jolie gives a fine performance as the evil Maleficent. But wait, Maleficent is not really evil is she? No, she was brutally wronged by her childhood friend – the future King Stefan (Sharto Copley), whom she believed was her true love – and all she wants is a little revenge. Making Maleficent a victim makes it very difficult for Jolie to really push the character as far as she might have. Instead of delightfully evil, Maleficent is ponderous and indecisive. For her part, Jolie does create the most rounded character of the film. That’s more than can be said for any other character in this film. After Maleficent curses Stefan’s poor baby Aurora, the child is inexplicably sent to live with annoying fairies. This doesn’t make a lot of sense. According to the curse, Aurora is safe until she is 16 (at which point she’ll fall into a death-like sleep), so why can’t she be safeguarded in the castle with her parents? This makes Aurora’s parents basically non-characters. Her mother disappears from the film altogether, only mentioning her when she is on the verge of death. Even then we don’t see her. We have no idea how she feels about not getting to see her only child grow up. Aurora’s father is driven into madness because of the curse. This is not because he misses his daughter, but because he can’t stand that Maleficent got the better of him. We only see this in glimpse because he is also does not play much of a part in this story. So what do we see? 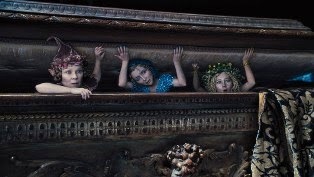 We see little Aurora grow up into a beautiful and charming young lady (Elle Fanning), despite being raised by the three most inept caretakers in the world. And apparently Maleficent doesn’t have anything to do with her time, because we see her and her servant Diaval (Sam Riley) observing Aurora for 16 years. 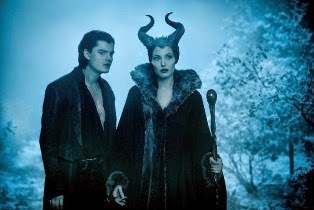 Both Maleficent and Diaval develop an attachment to the girl and now Maleficent regrets her vengeful curse. I actually didn’t mind this twist. Since Maleficent is a well-rounded character, it makes sense that she might rethink her actions and be less angry after 16 years go by. The problem is nothing has really happened up until this point, and suddenly we are thrust into the last act of the film. We’re rushed into an ending that can pretty much go only one way. We soon learn that the curse can’t be broken and Aurora does prick her finger and fall into a coma which can only be awakened by true love’s kiss. In the story most of us are familiar with, Sleeping Beauty sleeps for 100 years before her prince comes along to awaken her – and that’s another point, “true love’s kiss” is a part of Snow White – in Sleeping Beauty she is supposed to be awakened by the son of a king. Why does that matter? Because Disney has been shying away from princesses wanting nothing more out of life than to be rescued by a prince. Okay, I don’t have a problem with that concept, but is the ending of this film any more satisfying because it’s not Prince Phillip (Brenton Thwaites) who awakens Aurora? It’s Maleficent who possesses true love’s kiss for Aurora. Not in a romantic way, but as her surrogate mother. Are we supposed to be glad about this? Is this heartwarming? Let’s think about it. Maleficent enacted a curse that forced Aurora’s parents to give her up (I know I said this was likely unnecessary, but let’s go with it), therefore they could not be a part of her life. Maleficent decided she would be the one to watch over Aurora, even befriending her when she became a teenager. In essence, Maleficent stole Aurora’s love from her parents. In the end Maleficent wins anyway. This could have been written as a dark twist to the story, but instead we are made to believe that Aurora has brought out the good in Maleficent and everyone is going to live happily ever after. Oh, and Prince Phillip is there too, so in the end the princess still gets her prince.